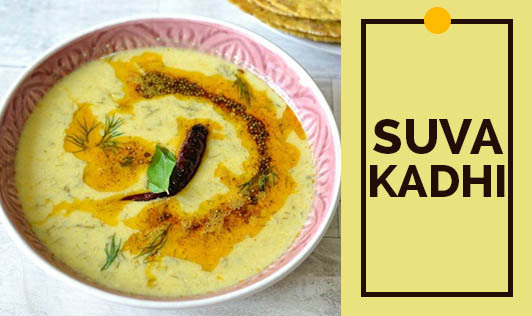 Suva kadhi is a homely preparation made with dahi, besan, dill leaves, and other spices. This kadhi is a very good source of calcium and meets almost quarter a day of your requirement. The best part is this recipe is not only healthy, but also tasty. • Mix curd, besan, and 2 ½ cups water to a nonstick pan. • Whisk well until no lumps remain and the mixture is smooth. • Add the ginger and green chili paste, curry leaves, sugar, and salt to the mixture. • Cook for 2 to 5 minutes, while stirring continuously. • Now heat oil in a nonstick pan, add the jeera and mustard seeds. • When the seeds splutter, add the hing and Kashmiri chili. • Sauté on medium flame for a few seconds. • Add this tadka to the kadhi and mix well. • Finally, add the dill leaves, mix well, and cook for 2 minutes, while stirring occasionally. • If the curd is sour, reduce the water, and replace it with ¼ cup of milk.